When faced with an elaborate property removal, don’t go into overdrive trying to handle and deal with everything on your own in the sake of shaving a few pounds off the end bill. Instead, you are much better off using one or more of our professional removal services, covering anything from single item relocations to fully comprehensive business removals and all in between. We will not cost you a small fortune either, at Removals Seven Sisters we know how to keep our prices within reasonable limits without compromise on quality or efficiency of our work. Expertise, punctuality and professional dedication are just some of the factors that allow us to be arguably the most affordable moving company in the N15 area. Furthermore, our private and business customers will receive free of charge, no obligation service quotes, fair pricing that corresponds to the specs of the job, and great midweek discounts on all moving services. Customised service packages for more coverage and extra value for money can also be arranged for. 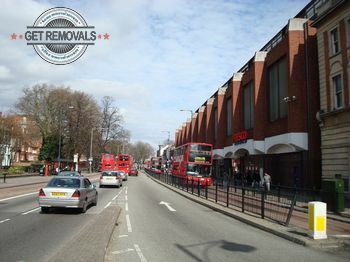 Households and commercial establishments in Seven Sisters N15 can take advantage of the many versatile and affordable removal services organised and provided by Get Removals. With years of relevant industry experience in all types of property relocations and goods delivery services – we are the movers you can trust. Getting your belongings safely and swiftly from A to B is the aim of the game. Therefore, we have made sure to have everything covered from start to end. First of all, we work with specially trained movers and experienced drivers who have the necessary practical skills and technical expertise required for the job. This translates to no risk of damage of items during packing, shifting and loading on board. Second of all, we own a large number of specially equipped removal vehicles ranging from nimble city vans to heavy duty transport vehicles. This means there will be no costly delays or any foreseeable setbacks during the safe transit and timely delivery of your belongings. Regardless of the fact that we work with specially qualified professionals, we recommend for customers to use our specialised packing service, alternatively customers can self-pack in which case we can deliver the required packing materials. Our dedicated, highly skilled removal technicians and professional drivers will take all necessary precautions to ensure and guarantee the careful handling and safe delivery of all customer belongings. All services can be customised accordingly, or requested in combination with various additional options. Not having to deal with tedious removal prep work is great, as you have more time and energy to be out and about. The Seven Sisters area will keep you occupied while we do the heavy lifting. Seven Sisters was formerly known as Page Green, officially the name Seven Sisters did not appear until eighteen o five. The name Seven Sisters is in fact related to Page Green. Once there were seven elm trees growing in a circle, around a walnut tree. The place where the trees were growing was a piece of common land, precisely known as Page Green. The walnut tree growing in the middle of the Seven Sisters (the elms) is the more interesting participant in this tale. Local rumour has it that the walnut was growing in that spot as early as the sixteen hundreds. Some believed the tree marked the site where an unknown Protestant was executed. Others however believed the walnut was an ancient tree dating back to Roman times marking an ancient pagan worship site. Seven Sisters is a suburb of North London, in the borough of Haringey. The peculiar name of the area comes from a group of seven elm trees which once stood in a circle around a walnut tree, in the centre of Page Green.